In 2008, very significant progress was made by the Ministry of Agriculture and Rural Development (MoARD) and the Central Statistics Authority (CSA) in reconciling the long standing differences in crop area estimates through the EC-funded FAO project “Support to Food Security Information System”. Accordingly, the Mission used, for the first time, pre-harvest planted area estimates generated by the annual sample survey of the CSA. CSA’s post-harvest data for the 2008 Meher season indicate a cereal and pulse production from the private peasant sector of 16.46 million tonnes, about 6 percent above the previous year’s post-harvest estimates. This was the fifth consecutive good Meher harvest. Adding the output of the commercial sector and a conservative forecast for the 2009 Belg season, the total estimate of cereals and pulses production in 2008/09 is put at 17.39 million tonnes. With an estimated total cereal and pulse utilization of about 18.26 million tonnes, total import requirements for 2009 marketing year (January/December) are forecast at 695 000 tonnes. Latest available data indicate that up to end of April 2009, 283 000 tonnes have already been imported (of which 259 000 as food aid). 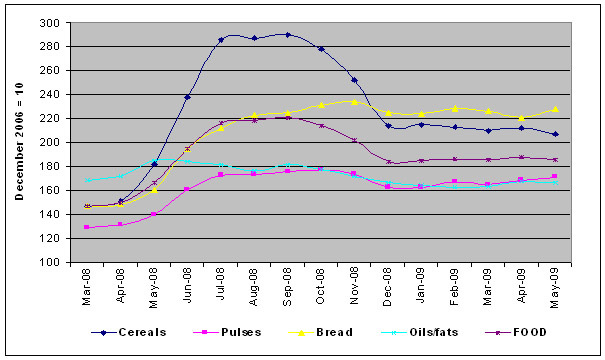 Throughout the country, cereal prices reached a record level in September 2008 and dropped by 26 percent in December 2008, reflecting the improved 2008 Meher production and the general decrease in international food prices. 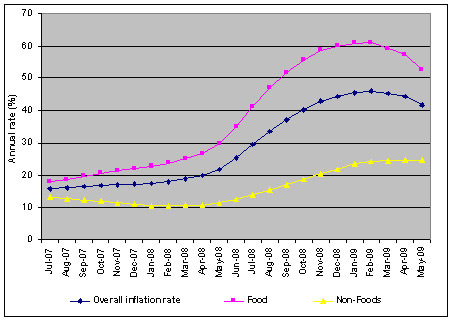 Cereal prices have since stabilised throughout the first half of 2009, but still remain at above average levels, with national cereal prices 15 percent above a two year average (May 2007 – May 2009) in May 2009. Although the overall Meher crop production has been improving over the last five years there are still households that are food insecure. These are the 7.5 million persons chronically food insecure under the productive safety net programme (PSNP) and an additional 4.9 million people facing acute food insecurity for the period January to June 2009. This population is mainly due to the failure of 2008 Belg rains that affected crop production; the poor coffee and root crops especially in Southern Nations Nationalities Peoples’ Region (SNNPR) and three almost consecutive poor Gu rains affecting pastoralists. Hence, the populations in need of food assistance are spread mostly over the eastern half of the country, with the most affected areas in Somali, Amhara, SNNP, Tigray and Afar regions. As a result, in addition to supporting the PSNP beneficiaries, the government and its partners needed approximately 591 503 tonnes of food to support the extra caseload of 4.9 million persons between January and June 2009. Reports from the field indicate that the 2009 Belg rains have performed poorly but not as badly as the 2008 Belg that were considered as total failure. The 2007 Meher assessment had predicted that a total population of 2.2 million would need food assistance for the 2008 calendar year. However after the failure of 2008 Belg, this figure was revised upwards to 4.6 million in April and again to 6.4 million by August. Judging by performance of the 2009 Belg so far, this mission believes that the total number of persons in need of food assistance will be similar to the 6.4 million in 2008. While the ongoing Belg assessment will shed more light on proper estimates of persons in need of food assistance, if the numbers in need of food assistance increase, there will be a corresponding increase in the amount of food needed. There have been improvements in the way Meher assessment is carried out. Previously the assessment used to come up with only food needs. The 2008 Meher assessment identified other factors that affect food security at the household level and included emergency needs for water, sanitation, health, nutrition. In some cases education needs were also identified. This mission recommends that this trend be enhanced through training of teams on how to assess needs in other non food sectors. All the Meher assessment teams, except in Gambela and Benshagul Gumuz, used the household economy approach (HEA) to derive the numbers of people in need of food assistance. There is need for a closer linkage in the analysis of the food and non food needs, as different approaches seem to be used. As in other years, for the Meher need assessment, the multi agency assessment teams and regions compiled reports and sent them to the federal government. After reports are received at the federal level, most of the participating agencies are not consulted when the federal and regional governments revise some of the numbers of persons in need of food assistance. In the true spirit of partnerships; it is recommended that the whole assessment process remains transparent from the training, data gathering and processing and final analysis at the federal level. The government has intervened by supporting the urban poor through the stabilization program. The rural poor who depend on crop and livestock production should continue to be supported with food assistance up to November 2009 when it is expected that the Meher green crops will start to be consumed and livestock condition may have improved (if Meher rains are normal). The monitoring of food prices in affected areas should be continued and enhanced, especially in Somali region. In view of the poor performance of Belg rains the government and agencies are encouraged to put in place contingency plans to address possible increased food assistance needs up to December 2009. The FAO together with Ministry of Agriculture and Rural Development (MoARD), the Bureaux of Agriculture and Rural Development (BoARD) and the Central Statistical Agency (CSA), participated in the 2008/09 FAO/WFP Crop and Food Security Assessment Mission (CFSAM) from 16 November to 12 December 2008. The assessment concentrated on aggregate crop production and macro-economic issues and also analyzed the resultant cereal supply/demand. The Meher needs assessment led by Disaster Management and Food Security Sector (DMFSS) together with other partners, including WFP, was conducted from 17 November to 12 December 2008 and concentrated on the assessment of emergency food and non-food needs, at the micro/household level. Hence, this report represents a synthesis of the main results and recommendations of the two assessments carried out towards the end of last year with some updates due to the availability of new information. Following an agreement between the CSA and the MoARD, the basis for the calculations of the 2008 Meher cereals and beans production in Ethiopia was based on CSA pre-harvest planted area estimates and not by MoARD data as in the past. The decision by MoARD and CSA to work together in using one data set resolved the past technical and methodological issues. The EC-funded FAO implemented Project “Support to Food Security Information System” whose objective is, inter alia, to reconcile the long-standing differences in planted area estimates, supported the process. The CSA post-harvest grain production estimates indicate a total 2008 Meher cereal and pulse production (only of private peasant holdings) at 16.46 million tonnes, about 6 percent above 2007 CSA estimates. This figure is 3.8 percent less than the pre-harvest estimates reported by the CFSAM in January 2009. This is the fifth consecutive year of good Meher grain harvest and mainly attributed to well-distributed Meher rainfall in major producing areas, the higher financial returns prompting increased investment in farming operations, the wider use and timely availability of inputs, and the effective control of migratory pests. When production of commercial sub-sector is added to CSA post-harvest data, the 2008 national Meher production of cereals and pulses is estimated at 16.79 million tonnes. With a Belg production to be harvested in July/August 2009 conservatively anticipated by the Mission at 600 000 tonnes, total domestic availability of cereal and pulses for 2009 is estimated at 17.39 million tonnes. Assuming a per capita average consumption of 185 kg of cereals and pulses, about 6 percent lower than the previous year as a consequence of the rising prices, total utilization is estimated at 18.26 million tonnes. Total import requirement is therefore estimated at 695 000 tonnes. Available data on imports indicate some 283 000 tonnes of cereals have been already imported up to the end of April 2009 either commercially or as food aid. Table 1 shows the updated national food balance sheet based on the CSA post-harvest data on area planted and production. The Ethiopian economy has experienced a broad-based and steady growth of real GDP over the past five fiscal years, averaging 11.5 percent since 2003/04, with real GDP growth in 2007/08 estimated at 11.6 percent1. However, as a consequence of the international economic downturn, lower investments and a contraction of remittances, GDP growth is forecast to decline to 6.52 percent in 2009. The main determinant of Ethiopia’s recent economic growth has been the expansion of agricultural production. However, significant contributions from the manufacturing and service sector as well as increasing construction projects in several urban areas are also fundamental factors. Nominal domestic revenue is forecast to continue its increasing trend during 2008/09. This reflects some improvements in the national system of tax collection and administration, as well as a rise in donor funding. The newly formed Ethiopian Revenue and Custom Authority has implemented a number of new initiatives in 2009 to improve the system of value added tax (VAT) collection, which is expected to further increase domestic tax revenue (total direct taxes have been projected to increase by 65 percent in 2008/09, compared to previous fiscal year). The fiscal balance is estimated to shrink further, but still remain in deficit, to approximately 1.5 percent in 2008/093, as the Government continues to tighten fiscal policy, eliminate domestic borrowing and reduce public enterprise borrowing to 1.1-2.2 percent of GDP in 2008/09, from 4.4 percent in 2007/08. The eradication of oil subsidies in October 2008 has also contributed to lower public expenditure and borrowing. With regard to monetary policy, the Government is committed to reducing money growth to below 20 percent in 2008/09, as a mechanism to stabilise prices and inflation expectations. The currency continued to depreciate in 2009 to an average of USD 1=ETB 11.25 in June 2009, mainly driven by the tight situation of foreign-exchange reserves, depleted by an increasing import bill. Some relief on foreign reserves is expected to take place in 2009 due to the disbursement of new grants, concessional loans by the donor community and as a result of lower import prices. Furthermore, the depreciation of the currency is expected to support Ethiopia’s export competitiveness, by offsetting the effects of an increase in the real exchange rate, and ensure a sustainable balance of payments. Total export earnings have registered substantial growth in recent years, owing to both increases in volume and revival in the prices of major exports in the international market. Conversely, the high import prices of some commodities, including food and oil, enlarged the import bill significantly in 2007/08, negatively impacting the balance of payments and creating a record trade deficit of USD 5.35 billion. However, the decline in international food and oil prices are anticipated to reduce the national import bill for 2008/09. The global recession in industrialised countries is likely to weaken demand for Ethiopian exports in 2009, reducing external revenue, which will be further exacerbated due to a contraction of international prices for key commodities, such as coffee. In conclusion, the reduction in remittances, foreign direct investment as well as the lower demand for Ethiopian exports is expected to offset the positive effect of the lower import prices and maintain a current-account deficit of 7.1 percent4 in 2008/09. Since the end of 2004, despite coinciding with the first of five bumper harvests (and preceding the soaring of international food prices), consumer food prices in Ethiopia started to climb steadily, as a result of strong demand pull factors. The overall annual inflation rate accelerated during mid-2008 and peaked in February 2009, reaching an average rate of 46.1 percent (based on 12-month moving average), while national food inflation reached a record rate of 61.1 percent during the same month. High international food prices, a weakened currency, expanding consumer demand and the partial failure of the 2008 Belg harvest are considered to be contributing factors. However, national inflation has shown signs of stabilising and decreased moderately between February and May 2009, but still remains 23.2 percentage points above the annual average (July 2007-June 2008). Similarly, in May 2009 food inflation stood at 52.6 percent, a decline of 8.5 percentage points since climbing to the record rate in February 2009, but still remains 29 percentage points above the average. Between March and September 2008, the national cereal price index doubled and reached a peak of 290.2 index points (December 2006 = 100), coinciding with the partial failure of the Belg season (see Figure 2). However, cereal prices (whose weight is about 23 percent of national CPI) dropped significantly from September to December 2008, reflecting the improved 2008 Meher production and the general decrease in international food prices. Cereal prices have since stabilised, and declined marginally, between December and May 2009, but still remain at above average levels. At regional level, cereal price fluctuations differ and high prices persist especially in the Somali Region, Benishangul Gumuz, Gambela and Addis Ababa, in comparison to prices observed in the same period last year. The particularly high prices recorded in the western regions of Benishangul Gumuz and Gambela have been partially attributed to the demand from the large number of Sudanese refugees as well as to the closer integration with the Sudanese market, which is more sensitive to international price fluctuations. The heterogeneity of regional food prices is also partly explained as a result of limited regional market integration, restricting trade between food surplus and food deficit regions. A recent study5 indicates that Addis Abba, Amhara and Oromia markets share similar food prices fluctuations, suggesting greater integration. A number of policies introduced by the Government to mitigate the high cereal prices experienced in 2008 have had a stabilising effect. The elimination of value added tax, turnover tax and surtaxes on selected food items have helped to control prices in urban markets. While, the distribution of subsidized imported wheat, approximately 3 percent of domestic wheat production, to low income urban families and directly to flour mills, has helped to maintain households’ stocks and, to some extent, limit reliance on markets. Furthermore, the above average national cereal prices, 12 percent higher in May 2009 relative to last year’s prices, is likely to have suppressed demand – taking into consideration that cereal expenditures account for approximately 50 percent of a households’ food budget – contributing to maintaining price levels, but leading to consumption losses either in quantity and/or quality of food. However, in efforts to offset the negative impact of price increases and sustain income levels, the Government increased the cash transfer in the Productive Safety Net Programme to 10 ETB per day. Cereal prices are always forecast to increase during the lean season as household stocks diminish, peaking in August, until the beginning of the next Meher harvest in October. Furthermore, the anticipated low performance of the 2009 Belg harvest is likely to contribute to price increases during this period. Despite the good performance of 2008 Meher season and the anticipated increased crop production at the national level, food insecurity at the household level still exists for some groups of people in certain locations. These are the 7.5 million chronically food insecure people under the PSNP and an estimated 4.9 million persons in need of emergency food assistance for the period January to June 2009 estimated by the government led multi agency humanitarian needs assessment mission. The 2008 Belg was rated as below normal. Apart from supporting the Belg crop production in Belg dependent areas, the Belg rains are utilised to plant long cycle–high yielding varieties (maize, sorghum and finger millet) in Meher dependent areas. Thus a failure of the Belg rains usually leads to reduced Meher crop production. In 2008 Meher producing communities replanted their fields with short term, low-yielding varieties of crops leading to overall reduced crop production. Additionally during the 2008 Belg, in some areas the short term crops were reported to have been affected by low precipitation especially in the low-lying areas of Afar, Oromiya, SNNPR and southern Somali region. The 2008 was a fifth consecutive good Meher production for the country. In addition to the good 2008 Meher season, the country experienced unexpected rainfall in October/November 2008 and in some parts January 2009. These rains were beneficial in replenishing water resources and encouraged pasture growth for livestock especially in livestock dependent regions of Afar and Somali. On the other hand these unexpected rains caused flooding in Gambela and low lying areas of Somali, Oromiya and SNNPR regions. clan conflicts especially in southern Somali region that has displaced approximately 200 000 persons. All the assessment teams used the household economy approach (HEA) to determining emergency 2009 needs8 except in Gambela and Benshagul Gumuz regions where baseline data was being developed. In these two regions traditional methods were deployed to come up with needy persons. When applying the HEA, teams gather information related to prices of commodities, harvest prospects, and coping. This information is fed into spreadsheets that already contain baseline data and results are automatically generated regarding the percentage of populations that fall under survival9 and livelihood deficits. The mission was informed that teams included both survival and livelihood deficits when arriving at the number of persons in need of food assistance. In Woredas that are covered under PSNP the final figures were arrived at by subtracting the affected figure from those registered under PSNP. 1 These figures were compiled from field reports by the 2nd phase CFSAM mission of 2008 since the official report had not yet been released by authorities at the time. 2 These are in addition to 7.5 million under PSNP beneficiaries. The Belg rains support crop production in the Somali region, Oromiya region lowlands of Bale, Guji and Borena zones. The rains are also important for some woredas of SNNPR where they account for 40-80 percent of the annual crop harvests. As stated earlier, in the regions of Tigray, Amhara, parts of north, central and eastern Oromiya and most areas of SNNPR the Belg rains are considered minor but they play an important role in supporting cultivation and planting of the long cycle Meher crops. In pastoral areas the Belg/gu/sugum are the main rains that support pasture and crop growth. See map below and seasonal calendar in the annex. So far the delayed onset and erratic performance of the Belg and gu rains is likely to increase food insecurity in Belg crop-dependents and pastoral areas of SNNPR, parts of Oromyia and Amhara. Most of the Afar region also received below normal sugum rains between March and May10. In the majority of the Belg11 producing areas rains were received in late march as opposed to the typical of early march. Some locations experienced dry spells of 2-4 weeks after planting. The delayed rains affected planting. WFP reports emanating from the field indicate that only 50-70 percent of the land in the Belg areas had been planted by May 2009. The performance of Belg rains had been rated as below normal in most areas as a result of low precipitation and dry spells experienced in those areas. According to FEWSNET, “the performance of the 2009 Belg season rains was erratic, with long dry spells, especially during the last dekad of April and the first dekad of May. These led to the wilting of maize, the most important Belg crop in most of these areas”. Therefore Belg maize production has been affected in most areas of the country except SNNPR. Because of the delayed Belg rains, the long term crops will inevitably be planted late, therefore Meher late planted crops (especially teff) may be affected by the rains at harvesting further aggravating the Meher crop production. Production of coffee, sweet potatoes and enset crops in SNNPR will be lower not withstanding the over consumption of the enset last year resulting from failed Belg of 2008. The Belg/Gu dependent pastoral areas may run out of water supplies sooner than normal and livestock migration may take place earlier than usual. In pastoral areas the terms of trade will be unfavourable as livestock body will deteriorate and prices of grain may increase in those areas. Pastoralists in the Southern zone of Somali region, neighbouring lowlands of Oromiya region and South Omo zone of SNNP region experienced below average rains in 2005/06, 2007, (gu and deyr), and 2008 (gu). The communities in these areas sold more of their livestock to access food and non food leading to reduced livestock herds. It will take three consecutive years for the livestock herds to reach baseline years. A below normal Belg will seriously hamper recovery and further affect food security of the households in pastoral areas. Possibilities of increased malnutrition in the country are eminent especially in the Somali region and parts of SNNP region. In coffee producing areas, the poor household that depend on labour to access incomes will be at risk of food insecurity because coffee production may reduce (so will labour opportunities). 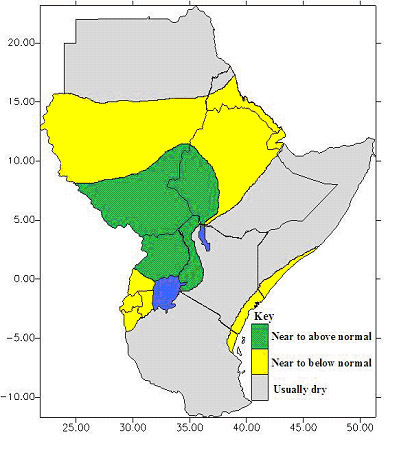 Forecasts for rainfall during the main cropping season and in northern pastoral areas are below normal, particularly in areas of the east where production was poor this year, raising concerns that a serious food crisis could emerge in Ethiopia over the next year12. The IGAD Climate Prediction and Applications Centre (ICPAC) rainfall forecast for March to May 2009 for parts of northern Ethiopia was below normal to below normal. See map below. After taking into account of the 2008 good Meher harvests in the country, the performance of the 2009 Belg rains so far and the anticipated below normal 2009 Meher forecast, this mission formed the opinion that 2009 would be similar to 2008. Therefore population in need of food assistance will be similar to the 6.4 million in 2008 for the period July to December 2009. The government–joint 2009 Belg seasonal assessment that commenced on 8th June is expected to come up with the proper estimate of the Belg rainfall impact on crop production and food security situation for the season. Most nutrition surveys in Ethiopia are not conducted for surveillance purposes rather as emergency surveys to ascertain a reported nutrition situation in order to facilitate/inform possible emergency response or as monitoring surveys following an intervention. In December 2008 information available indicated that malnutrition had continued to decline. This was attributable to the Meher good harvests and various food security programs implemented by the government and its partners. Nonetheless high malnutrition rates continued to be reported in Southern zones of Somali, SNNP, Amhara and Oromiya regions. For example in Amhara the Global acute malnutrition (GAM) for June 2008 was 12.2 percent with Severe Acute malnutrition (SAM) of 0.5 percent compared to 14.4 percent GAM and 0.9 percent SAM in December 200813. The government, through PSNP, is providing support to 7.5 million chronically food insecure people in identified woredas annually through provision of food and cash. The program is able to mobilise up to 20 percent more resources of the budget in the event that there is increased food insecurity in affected woredas. In 2008 as the country faced increased drought and high food prices the number of food insecure people increased drastically. In many instances households in the PSNP woredas preferred to receive food assistance as opposed to cash. WFP has been involved in providing food assistance to people in Ethiopia through interventions that include assistance to drought and flood-affected households, malnourished children under the age of five and to pregnant and breast-feeding mothers, to school children, people affected by HIV/AIDS, refugees and communities working on land, soil and environmental rehabilitation activities. These activities are carried out in conjunction with the government, UN agencies and other NGOs operating in the country. The government’s Emergency Nutrition Coordination Unit (ENCU) has been working with WFP, UNICEF and other agencies identifying the hotspots woredas and malnourished populations that are given first priority in receiving food from the Government, WFP and other partners. At the start of 2008 WFP had planned to provide food assistance to about one million people but this rose to 6.4 million by the end of the year. WFP delivered 370 000 metric tones to affected populations mainly in SNNP, Oromiya and Somali regions. Additionally WFP provided 154 000 tonnes to 4 million people under the PSNP (against planned 2.4 million) with 2-3 months food rations. For the targeted supplementary feeding, WFP was able to supply 44 000 tonnes for one million people. Overall WFP delivered assistance to more than 11 million people during the year. Despite the achievements, WFP was faced with challenges of reduced resources at the time when more persons needed support. By July 2008, WFP was forced to reduce monthly rations by a third (cereals were reduced from 15 kg to 10 kg) and sometimes households did not receive other commodities like oil and pulses. In order to improve delivery of food to the vast Somali region, WFP and the Government implemented the “Hubs and Spokes” way of delivering food to the region. In addition to Dire Dawa, hubs were established at Degahabur, Kebridehar and Gode. Local companies and convoys were used to move food from hubs along spokes to 186 final destination points within Somali region. From October to December 2008 WFP had dispatched approximately 44 000 tonnes of food to hubs and out of this 38 000 tonnes had reached final distribution points. The organization managed to reach more than 950 000 people. This was a major improvement compared to previous years. Although there has been improvement in dispatching food to Somali region, at the time of compiling this report, WFP was finding it difficult to contract sufficient transport assets to move commodities from Djibouti to Ethiopia. Due to large fertilizer and wheat consignments in Djibouti, many transport companies were giving priority to transport Government fertiliser cargo resulting in shortages of trucks for WFP. With the poor performance of 2009 Belg rains and the continued government’s ban on bulk cereals purchases from the local markets for distribution in the country, local cereal procurement is not a possibility in the near future. Therefore, possibilities of pipeline break are eminent and the situation needs to be closely monitored to prevent escalation of food insecurity especially at the household level in affected areas. 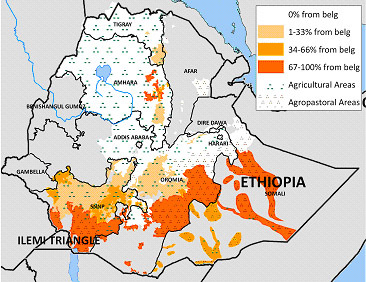 Ethiopia crop production is heavily dependent on rain fed agriculture thus failure of the rains impacts heavily on crop and livestock production. 2008 was a fifth consecutive good year Meher crop but a poor Belg impacts negatively on both Belg and Meher final crop production. Unexpected rains in November/December 2008 and January 2009 improved pasture, recharged water sources and led to improvement of the livestock but also caused some flooding in Gambela, lowlands of Oromiya and some parts of Somali region. Other aggravating factors like previous failed rains, restrictions, and poor terms of trade that led to excessive livestock sales and reduced herds will still affect livestock dependent populations. Although there was good production at national level, food insecurity still exists at the household level with 7.5 million persons under the PSNP support not showing signs of reduction in the near future. An additional 4.9 million was identified to need food assistance from January to June. With the below normal performance of the 2009 Belg and the near normal to below normal Meher 2009 forecast it is anticipated that this figure may rise to 6.4 million for the period July to December 2009. Admissions to outpatient therapeutic and stabilisation centres have been on the upward trend especially in SNNP and Somali regions an indication of poor food access and intake, probably poor utilisation of food and other related causes like hygiene, water and health of affected populations. An estimated 200 000 people have been displaced in the southern parts of the country due to clan conflict14. This may have negative impact on the communities where IDPs are staying. Coordination by the government and its partners improved during the planning and assessment of the humanitarian seasonal needs assessment. For the first time all teams assessed other humanitarian emergency needs as opposed to previously when teams concentrated on food needs only. Other non food needs assessed includes water and environmental sanitation, health and nutrition and in some cases education needs were also identified. There is need to train assessment teams on how to identify the humanitarian needs of communities. All the regions, except Gambela and Beneshagul Gumuz used HEA to determine food needs. Regions compile reports that are sent to the federal government who review and further discuss before arriving at the final figures. Agencies interviewed expressed their dissatisfaction on the final stages of the humanitarian seasonal assessment. This was in regard to how the final figures are reached by the federal government without the agencies input. Once multi agency assessment teams and the regions submit reports to the federal government discussions are held between the regional and federal government in order to reach at the final figures of persons in need of food assistance. It is not clear why some regions figures are reduced while in others the figures are increased. See annex for more details on assessment figures. The monitoring of food prices in affected areas should be continued and enhanced especially in Somali region. This is an arid region located in the north-eastern part of Ethiopia and has an agro-ecology characterised by low erratic rainfall and high temperatures. According to CFSAM, 2008 was a good year in regard to rainfall amount and distribution. The situation led to improvement of pasture. Crop production in Afar is limited to growing of sorghum, maize, cotton and some pulses under irrigation. Some rain-fed teff and barley are also produced. The regional teams projected that 86 428 persons (in addition to the 472 279 under PSNP) would need food assistance. The region relies mainly on Meher crop but some eastern parts are Belg dependent. In the eastern zones, much of the area allotted for long-cycle crop planting had to be left fallow because of the failure of the 2008 Belg rains. Consequently, the area under the high-yielding maize and sorghum dropped sharply. This necessitated a major shift in the cropping pattern to short-cycle but low-yielding crops such as teff, maize, sorghum and pulses like chick peas and vetch later in the Meher season. The overall weather during the Meher season in the western zones of the region was favourable for crop production despite shortages of rains experienced in a few lowland areas. The Meher rains came in time and their amount and distribution was good. However weather in the eastern zones was mixed but generally better than the 2007 year. The most affected areas are; the eastern lowlands of Bati, Jile Timuga, Dewe Harewa and Artuma Fursi (Oromiya Zone); Argoba, Ambassel, Worebabo and Tehuledere (South Wello); Kobo, Habro, Gubalafto (North Wello); Ankober, Minjar Shenkora, Berehet, Kewot, Efratan Gidim and the Menz areas (North Shewa); Abergele, Ziquala and Sehala (Wag Himra). Pasture and/or water shortages have already started to be felt in lowland parts of Argoba and Worebabo in South Wello; Berehet, Kewot and Minjar Shenkora woredas of North Shewa; and Ziquala, Abergele and Sehala woredas of Wag Himra; and Lasta woreda in North Wello. Unusual livestock migration was reported in these areas. Other affected areas are; who Tenta, Sayint Ajibar, Legambo, Mehal Tenta and Mekdela (South Wello); Delanta and Wadla (North Wello); and parts of Minjar Shenkora and the Menz areas (North Shewa) lost a considerable part of their livestock asset due to drought and related causes. In 2008, the PSNP program targeted about 2.5 million chronically food insecure farmers in eight zones. Due to increased needs this was later augmented by a further additional cash allocated from the contingency fund. The seasonal humanitarian assessment estimated that 1 366 331 million would need food assistance in addition to those already under PSNP. However the final figure of people in need seems to have been adjusted downwards to 995 095. The region relies on Meher crop production. The whole area experienced favourable weather conditions. There was some insecurity reported in 5 woredas during planting and weeding but this affected crop production insignificantly. The seasonal assessment concluded that overall production was estimated at about 5.5 percent higher than that of 2007. In insecurity affected woredas of Asosa and Kamash the expected increase in production was 4.5-6.5 percent over that of 2007. However the impact of insurgent activity affected some households particularly high in Homosha, Belo Jiganfoye and Kurmuk woredas where estimated decline in production was estimated at 17 percent, 24 percent and 36 percent, respectively compared to of 2007. The seasonal assessment projected that 35,232 persons fro Asosa and Kemashi woredas would need food assistance from January/February to June 2009. This figure was maintained in the final seasonal assessment report. The whole region is dependent on Meher rains and is usually food secure. Rainfall was favourable however the country wide unexpected rains of October/November 2008 resulted in flooding of areas lying along Baro, Golo and Akobo rivers. These floods affected crops in Itang, Jikawo, Wentwa, Akobo, Lare and Gambela woredas. The floods also destroyed flood recession planted crops in Gog and Jor woredas. Land put to crop use increased by 20 percent compared to average of previous 5 years. The recent 2008 Meher assessment estimated about 31,000 people mainly in Agnua, Nuer, Mezhenger zones and the Itang SP woreda who would require emergency food assistance in the coming year. The region benefits from both Meher and Belg rains. Erratic 2008 Belg rains were received in Jimma and Arsi zones. East and West Hararghe zones were most affected by poor rains. Some flooding prompted replanting in East shewa. Livestock deaths due to dry weather conditions were reported in Borena, Guji, Bale, lowlands of East Hararghe, West Hararghe, West Arsi and Arsi. PSNP has planned to increase the beneficiaries under the program from 1 378 876 in 2008 to 1 438 134 (an increase of 59 258 people). The seasonal assessment estimated that 937 688 persons would need food assistance in addition to the planned PSNP beneficiaries. The final approved figures were reduced to 683 839 persons (a reduction of 253 849). The western parts receive Meher rains while the eastern parts are Belg dependent. Some eastern parts of the region benefit from sappie showers that aid sweet potato planting. The 2008 Belg rains were poor but Meher rains were rated as good. The unexpected October rains affected teff and caused flooding in low lying areas of the region. Some hailstorms are reported to have reduced coffee yields. Meher crops production was expected to be better than 2007 crop due to good rains and increased acreage under production. As a result of low coffee production, high grain prices, low livestock prices areas of sidama, Gedeo, south Omo and Guri special woreda were expected to face poor food security. Also in need of food assistance are areas that were affected by floods such as Shashogo in Hadiya. In 2008 the PSNP beneficiaries were 1 298 981. The figure of planned beneficiaries for the 2009 is 1 459 160 (an increase of 160 179 persons). The regional assessment team projected that in addition to PSNP; 922 402 persons would need emergency food assistance. However the final report indicates that 881 739 persons would need food assistance from the region (a reduction of 40 663 persons). Tigray is located in the northern part of Ethiopia and neighbouring Afar region. The region is classified as a food deficit due to its semi arid and high population density. 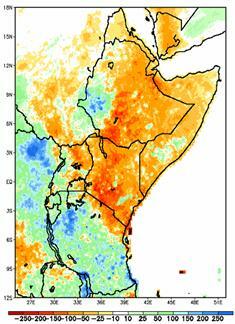 The southern 6 woredas produce Belg crops while the rest of the region depends on Meher rains. The Belg rains were poor and as such there was failure of the Belg crop production. The Meher rains were received late and not sufficient to support crop production. The poor Belg and Meher reduced run off floods that is used to support farmers in the southern zones fertile plains of Alamata and Raya – Azebo (Mehoni) reducing planting in both woredas. The final reported persons in need of food assistance were 674 304 in addition to the 2009 registered PSNP 2 519 829 beneficiaries. The region is inhabited by a nomadic population of nearly 3.5 million people who are highly dependent on livestock. The main rains in this region are received from April to June (Gu rains). Minor rains are from October to November/December (Deyr). Overall the performance of 2008 Deyr rain in the seven deyr receiving zones of the region was good in comparison to previous years. But in Warder and Korahe Zones the amount of rain was insufficient. The Karan (July to September) rain in Jijiga and Shinille Zones was rated as poor resulting in bad crop performance, pasture and inadequate water for livestock consumption. Pasture shortage is expected in the northern parts of Shinille including the entire Aysha woreda and north of Erer, Afdem and Shinile woredas. By January 2009 livestock was reported migrating from Shinile & Aysha to Guban of Somaliland. Pasture shortage was also reported in Jijiga zone (Babile, Jijiga and Harshin woredas). January to March is usually a dry period (jilal) for the region. Majority of households in this region obtain most of their food (>80 percent) through purchases after selling livestock. Typically low supply of grains in the local markets and high price of cereals and imported food items affect food security of the inhabitants in many years. Due to poor body condition of livestock the price of marketable animals was low leading to low terms of trade. PSNP is being piloted in a few woredas of the region. The joint assessment estimated that 1 673 403 persons would need food assistance from January to June 2009. The final approved beneficiaries were 1 550 143 (a reduction of 123 260 persons). This report has been prepared by Mario Zappacosta, Jonathan Pound and Prisca Kathuku , under the responsibility of the FAO and WFP Secretariats. It is based on information from official and other sources. Since conditions may change rapidly, please contact the undersigned if further information is required. Two scenarios were usually presented; the scenario showing that populations could utilize coping mechanisms and the second one where the populations were assumed that they would not cope. The second scenario was preferred to come up with the final figures for persons in need of emergency food assistance. These are persons that have almost exhausted all coping mechanisms. The livelihood deficit group may still be able to cope by utilising some form of coping that in most cases is considered not sustainable. Parts of Tigray, Amhara, SNNP and Oromiya regions. WFP Ethiopia country food security update – 24 February 2009.